If you use the events template feature of RSVPMaker to create multiple events including the same boilerplate details that repeat every time, now you can also create automated reminder messages for each of those events more easily. When you create a series of events based on a template, each event gets a copy of the basic content (where and when you meet, who to contact with questions) and most of the associated metadata (like whether RSVPs are being collected, whether there is a fee, what event type the post is associated with). However, the reminder message setup isn’t duplicated by default — and you might not necessarily want the reminder message to be the same each time. Just like you do not want to automatically overwrite the content of posts that might have been updated independently of the template. On the other hand, you may want the reminder message to be the same (or basically the same) most of the time. Improving how this is handled is one of those features I needed for my own purposes. Since I run an Online Toastmasters club (Online Presenters) that meets every week, and every one of those meetings needs an automated reminder message to the people who signed up to attend as a guest. The reminder includes details like the online meeting link and basic instructions for how to sign in. Adding those reminders one meeting at a time was a drag. 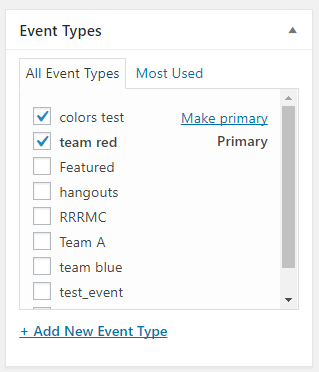 Now, when you update a reminder message for any event associated with a template, you will see an option to apply that update to all the other events associated with that template. This is similar to the process for updating events based on a template, where you can click “Check all” but still make exceptions for special events that require a slightly different message. Checking reminders to be updated. 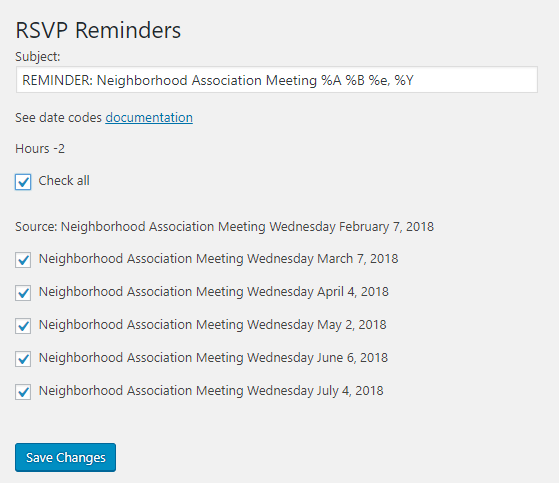 Note that the subject line includes a series of date formatting codes, which default to the same ones used in your site’s “long date” format from the RSVPMaker settings page. You may want to tweak it, for example if you do not think it’s necessary for the year to be displayed. For basics on how the reminders function works, see this post. RSVPMaker users have periodically requested that I add a standard way of recording event locations. If you were organizing a series of events at a specific location, you could create an event template, but RSVPMaker didn’t have a way of managing locations independently of events. Now it does. One reason I hesitated was I didn’t want to provide a template that would lock you into a specific presentation, without taking into account individual preferences for which mapping service to use or how events should be presented to your audience. 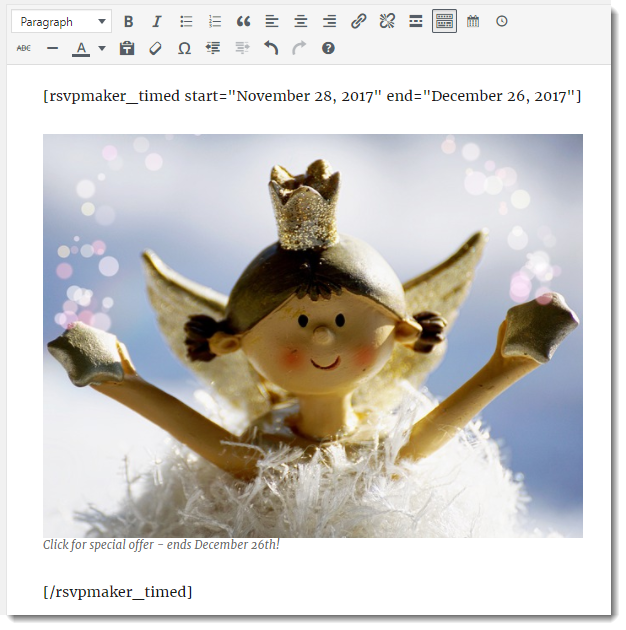 My solution is to provide a default format but let you edit it however you want, using the WordPress editor. Details like whether you want the location to appear at the top of the post, the bottom of the post, or in the middle are left up to you. I’m shooting for a little more consistency, but no foolish consistencies. 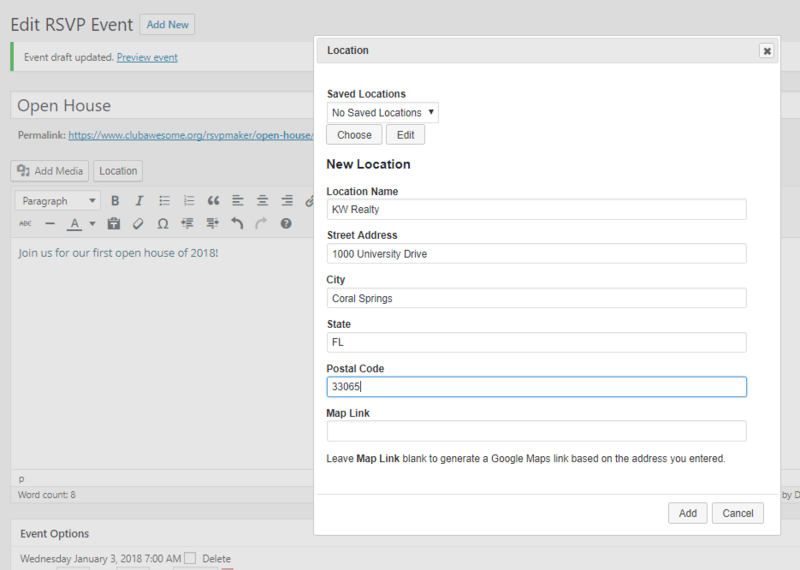 Click the Location button in the event editor, and you will get a form that lets you add a new location. Give it a name and put in the address details. You can manually add a map link or let the software generate a Google Maps link (be sure to test it afterward to make sure it guides people to the right address). When you click Add, the formatted address will be inserted into your event post. It will also be saved as a special kind of RSVPMaker post. The next time you want to add that address, you will be able to pick it from the dropdown list and click Choose. You can change or enhance the content of one of these saved locations using the WordPress editor. For example, you might want to add a location photo to point out a hard-to-find entrance. Locations are listed under RSVP Events when you have it set to Show All (rather than sorted to show only future events). The Edit button shown in the dialog above will also guide you to the correct post. Here’s an example of retrieving that sample location to add it to an event post. I hate outdated websites. If the event or the deadline is past, why are you telling me about it? Outdated websites are the worst. Particularly when it’s obvious. When you view the home page and it’s advertising an “upcoming” event that happened a week or a month ago. Or urging you to take advantage of a limited time offer for which the deadline is already past. Is that really the worst thing a website could be? Nah, I suppose it could be ugly or disorganized or unprofessional in a lot of different ways. But it’s one of the things I see regularly on websites that are otherwise very polished. The big event, or the date of the big promotion, has come and gone, but no one has gone back to refresh the website. If it goes on for a few days, it’s forgivable: we all have lots of other things to do. Pretty quickly, though, it starts to look like a sign of neglect. Here’s the thing: computers can tell time. Content management systems can be configured to let outdated content expire or fade into the background. Just by using a blog and posting to it regularly, you can display your latest content more prominently than older content. For people to be able to find your original announcement of an event in the blog archives isn’t a bad thing, as long as there is more recent content (photos of happy people in the event recap) piled on top. 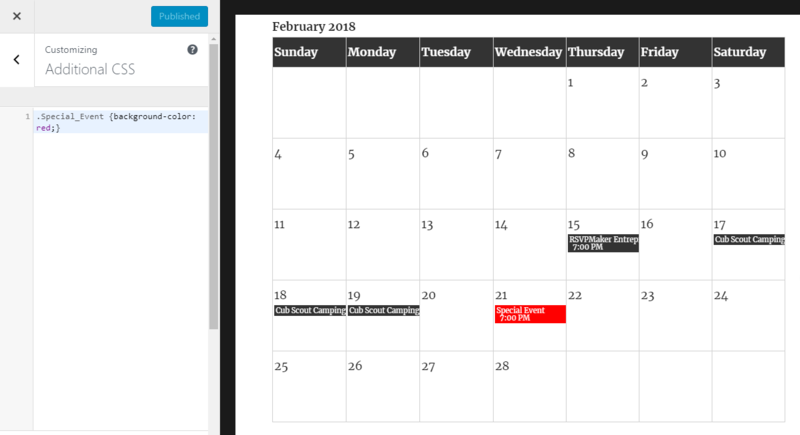 RSVPMaker event listings address this in a different way, allowing you to display a calendar of events in order of event dates as opposed to in order of posting date (blog style). Site visitors can navigate back through the calendar to find old event posts, but the upcoming stuff is always displayed more prominently. When you want to embed a featured event on the home page, you can set that up using the rsvpmaker_one shortcode and specify that it should expire after the date is past. I also provide an rsvpmaker_timed shortcode that you can wrap around any block of content with start and/or end times specified for when it should be displayed. (Both are not new but have been improved in recent releases). The rsvpmaker_one shortcode is particularly intended as a way of displaying an event on the home page or a landing page. 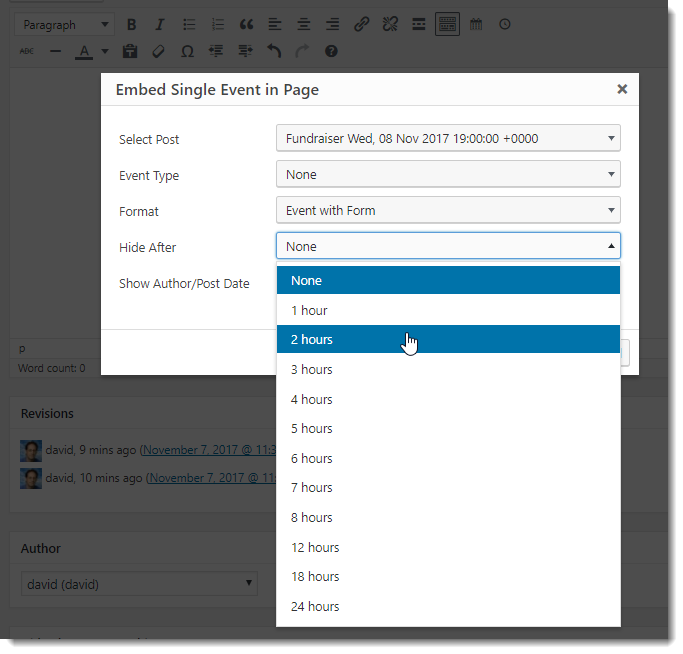 Use it to display a specific event, or the next scheduled event, or the next event in a specific category (like the next webinar). You can display the full event, with either the RSVP Now! button or the registration form included, or a show compact version. You can also extract elements like the date, the button, or the form to be used in a custom layout. In the context of this post, the important thing is that it can be set to expire (disappear off the page) when the event date is past. There is a button on the button bar (the clock icon) to help you get the parameters right. Retrieve a specific event by ID and display it along with the registration form. Expire it 6 hours after the start time of the event. Show the next event in the webinar category (if none is scheduled, don’t show anything). Instead of displaying the whole form, show the RSVP Now! button. You can also add a style attribute where you specify CSS for a div to be wrapped around the featured event. Example: style=”border: thin dotted #222; padding: 10px;” for a dotted border. The rsvpmaker_timed shortcode is a quick-and-dirty way of specifying a start and/or end date for displaying a chunk of content. I’m sure there are other plugins or themes that provide something like this as a feature, but consider this a little something extra you get “for free” with RSVPMaker. The output is similar to what you would get from the example shown above (the one with the closing [/rsvpmaker_timed] tag), except that we’re pulling the content from another post. The style attribute is also available with this one, if you would like to apply a border or background color to the featured chunk of content. If you don’t specify time of day, midnight is assumed (a December 26 end time means the post will stop displaying 1 second after midnight that morning). To make the start and end times unambiguous, you may want to put them in SQL format. I currently don’t provide an editor button for finding the post or page ID, but you can grab it easily enough from the address bar in the WordPress editor. I would typically suggest creating this chunk of content as a blog post. If you don’t want to make it public in the regular navigation flow of the site, you can save it as a draft and still use the WordPress editing tools to format and update that chunk of content independent of the page you are embedding it in. If you want to use a page or any other post type, you need to add a post_type attribute. Note that if you use a caching plugin, content may not disappear immediately after the end time you specified but only when the cache is purged or refreshed. Those are my latest entries in the war against outdated web content. Author David F. CarrPosted on November 7, 2017 November 7, 2017 Categories Announcement, TutorialLeave a comment on I hate outdated websites. If the event or the deadline is past, why are you telling me about it? Improvements for RSVPMaker often arrive when I see the need for them in my own projects, and recently I found myself creating a landing page for a series of workshops at Online Presenters. 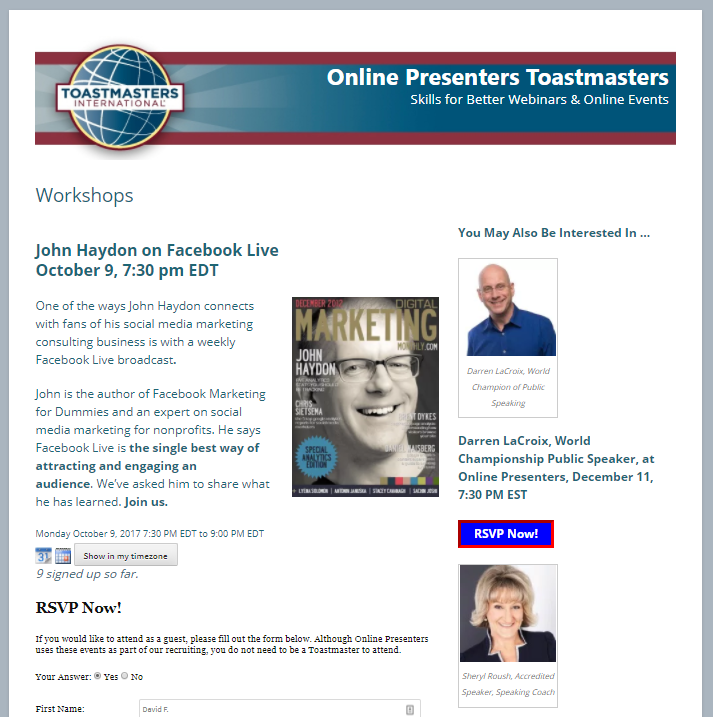 This is a Toastmasters club I founded, which focuses on helping members develop skills for webinars and online meetings, presentations, and trainings of all sorts. I’ve updated my pricing on two easy ways to get access to a WordPress website with RSVPMaker events management already integrated, lowering the price of entry to $75 from $99. Hosting your site with Carr Communications Inc., creator of RSVPMaker, makes sense if event management is one of the main purposes of your site. 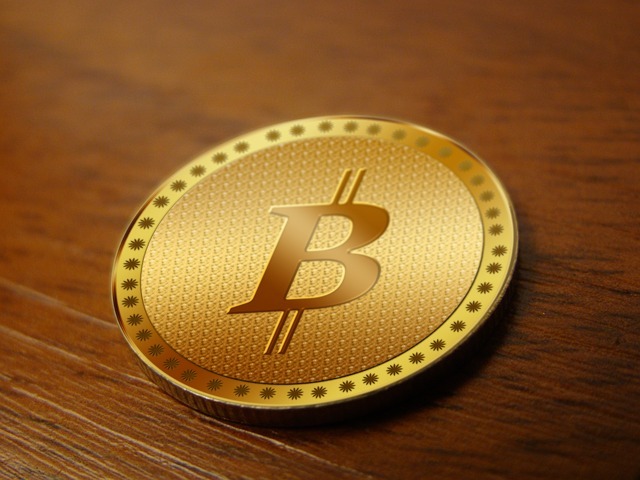 We can offer closer support, including PayPal setup, if you host your website with us. 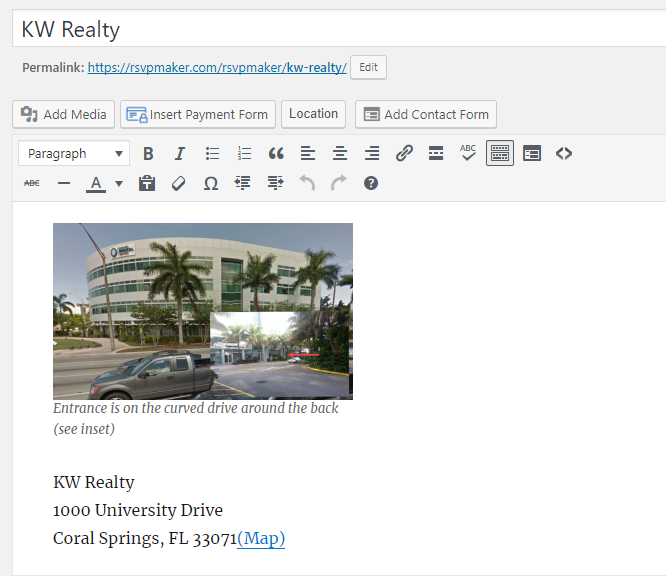 For $75 per year, you get a website at an address like seminar.rsvpmaker.com. We handle the web hosting and technical details, but you get access to all the standard WordPress features, plus the event management capabilities of RSVPMaker. This fee includes assistance setting up the site to allow you to accept event payments via PayPal. In addition to posting your events, you can promote them through the blog and build out other pages for details like speaker bios and your event agenda. Price: $175 per year for hosting of your own independent website, plus configuration assistance and RSVPMaker support. This gives you greater freedom to configure your site however you want and make your own decisions about adding themes and plugins, without being limited to those available on RSVPMaker.com. Note: Hosting fee does not include domain registration or copywriting, consulting, and design services. It does include setup and proper configuration of WordPress site and RSVPMaker, as well as updating of all code so you always have the most recent, most secure, and most functional versions. As with hosting anywhere else, the customer gets FTP access to the server and can perform their own additional customizations. Includes 5 GB disk space. Data center services provided by LiquidWeb, comparable to standard shared hosting plan. The latest updates to RSVPMaker were inspired in part by this post on the WordPress.org support forum for the plugin. Users within my organization tend to forget that they’ve registered for an event and wind up RSVP’ing multiple times. How can I restrict duplicate entries with an error message that says that they’ve already RSVP’d to an event? Looking up matching RSVPs by email address. A user can follow the link in that prompt to update their previous registration, if necessary. Or they may just need to be reminded that a registration for them is already on file. This mechanism is actually a fallback. The standard email confirmation message includes an Update RSVP link users can follow to update their record. However, that only works if they go back and find the confirmation message. Similarly, when you invite people using the MailChimp integration, their email address is embedded in the RSVP Now button. The idea there was always to save them some typing by looking up profile data from any previous RSVPs so they would not have to type it in again. (In the process of updating this code, I fixed a few bugs that were preventing this process from working properly). If someone responds to the invitation, forgetting that they previously registered, RSVPMaker will ask them if they want to update their previous response. Similarly, if RSVPMaker detects a cookie associated with a previous response to the same event, it asks if they want to update that response rather than entering a new one. What is the scenario where the user would NOT want to update the previous RSVP? There are scenarios where the user wants to enter multiple independent RSVPs under the same email address. Maybe an administrative assistant is registering several executives but wants all the confirmations to come to his or her email address. Another example is a couple that shares an email address, where the husband’s RSVP should not overwrite the wife’s or vice versa. My preference would be that one person enter an RSVP with one or more other people indicated as guests, but it doesn’t always work that way in practice. There are a few potential security concerns with this scenario. The high security option would be to require users to login with a password before completing the RSVP form, and their identity would be tied to that login. RSVPMaker supports making logins required, but in many cases the more important goal is to make it as easy as possible for people to register without having a pre-assigned password. The form builder utility (the popup you get when you click the “Generate form” button) also allows you to mark fields as private. If data has been recorded for that field, the message “Private data on file” is displayed instead of the private content. In other words, this prevents people from using your email address to look up your phone number or other information designated as private. However, a mischievous or malicious user could use the lookup by email function to alter someone else’s RSVP response. I haven’t seen this be a problem, but it’s not impossible. 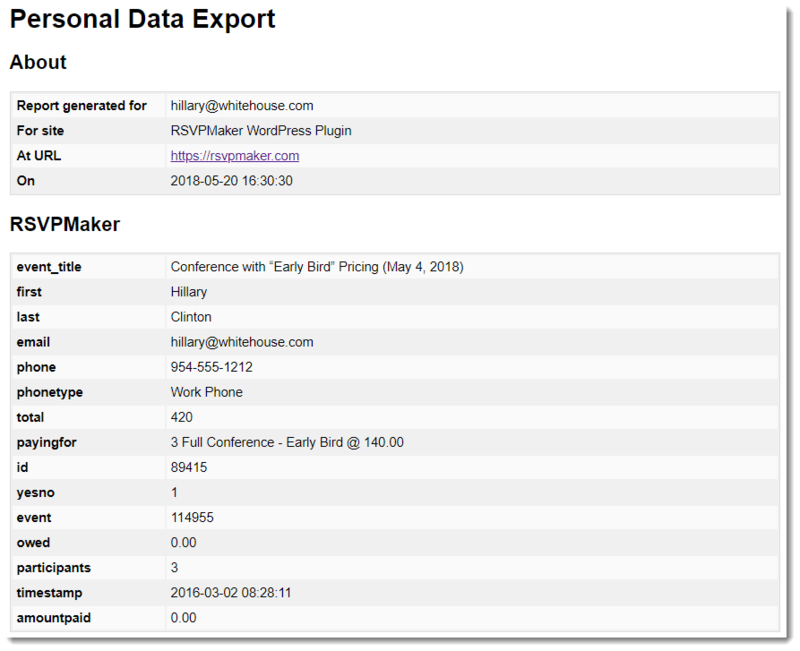 In the AJAX-powered email lookup example shown above, the data entry field for email appears before those for first and last name. The idea is to get them to enter their email address first. If we match it to a record, we want to do that before they have reentered a lot of the same information. I’ve made this the new default form layout for new users, but established users of RSVPMaker may need to tweak their RSVP form code. The form builder now includes an option to specify that the email field should come first.